In today’s increasingly paperless society, bills come and go in the blink of an email—if you’re like me, it can be difficult to remember which bills are due when. 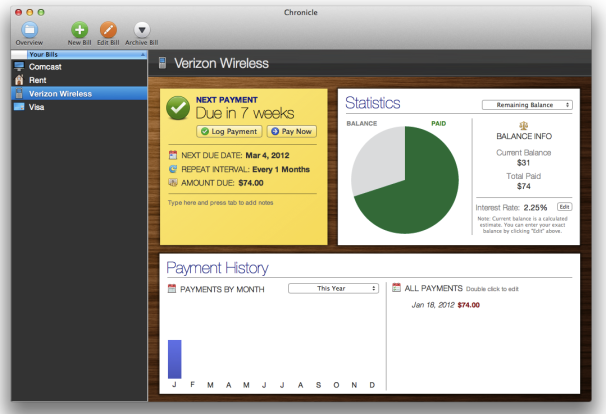 Chronicle (Mac App Store link) is a Mac app that tracks bills, expenses, and due dates for you. Chronicle stands out amidst a sea of overly complex financial applications by doing only one thing, but doing it very well—you enter your bills and set recurring dates and other relevant information, and Chronicle does the tedious work of not letting you forget when each bill is due. To be clear at the start, Chronicle doesn’t actually pay your bills for you. Rather, it tracks your bills by due date and reminds you to pay them. It also provides a record of payments, and it can track spending over time if you manually enter past payments. Chronicle stands out with a distinct visual style that separates it from the drab and boring grids and lists found in most finance apps and, dare I say it, almost makes entering bills fun. Large, color-coded pie charts and a calendar view make it easy to track bills, and charts and graphs track everything from year-over-year spending to the interest rate and remaining balance on a credit card you’ve yet to pay off. You can track bills by category type, with the option of using custom tags, and there are plenty of small touches throughout the app that illustrate the time the developer put into creating Chronicle. The other standout feature is ease of use. Chronicle makes it dead-simple to enter your bills; you can even attach scanned receipts to individual bills. The app then uses iCal to provide reminders before each bill is due, and offers one-click access to each vendor’s website (provided you supplied the URL when entering the respective bill). Chronicle can optionally store its data in iCloud or Dropbox, with the latter option especially useful if you wish to sync your data across multiple Macs. One limitation we pointed out when we reviewed Chronicle 3.4 a few years back remains: Chronicle doesn’t offer a way to track all of your debts at once. Another drawback is the way the program treats monthly income: After entering your income in a text box, the app simply adds that amount to an income report and uses it for budgeting purposes. It would be helpful if Chronicle gave you more control over this aspect of the app—for example, a way to set your bi-weekly pay dates—since it’s something you do every month. My only other gripe with Chronicle is a small one. As mentioned above, Chronicle offers one-click navigation to payment websites. However, if you forgot to add a vendor’s URL when entering a bill, clicking Chronicle’s Pay Bill button does nothing. I’d like to see an alert reminding you that you didn’t enter a URL—and, ideally, offering the opportunity to do so. Chronicle is one of the slickest finance apps available for the Mac. It’s easy to use and easy on the eyes, and it’s worthy of a spot on anyone’s Dock. Brendan Wilhide is a frequent contributor to Macworld.